I’m all about getting the fastest Internet available if it’s at a reasonable price. With so many devices these days connected to the Internet, it’s hard not to live without it and the connection speed is definitely important. Who’s got time to wait around on a slow connection? I’ve had Comcast Xfinity Internet with Blast! Speed for about 1½ years now and been pretty happy with the speed. I got the 1 year special which was at the time was $49.99 for 1 year and that was for Internet only. 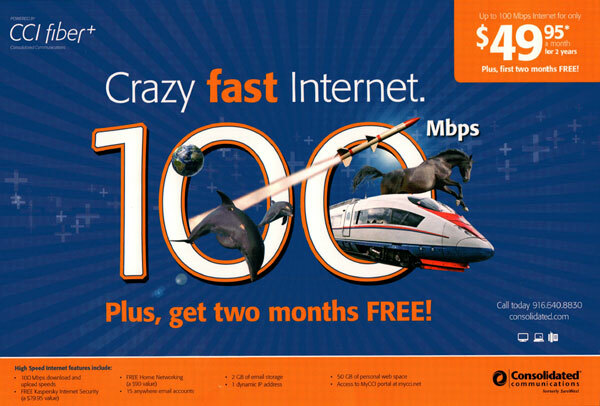 They currently have a deal for Internet Plus w/upgrade to Blast! and TV for $54.99. After the 1 year contract, the internet price goes up to $78.95 a month. Which is about a $24 increase. For me it’s a $29 increase since I was paying $49.99. Enter Consolidated Communications formerly SureWest. They have been heavily promoting their “Crazy fast Internet 100Mbps” CCI fiber+ deal for about a month now and I’ve received probably 4 flyers from them. The 100Mbps deal is $49.95/mo for 2 years and you get 2 months FREE. I have decided to give them a try since it will be saving me around $30 a month for 2 years for a total of around $720! I’ll be trying CCI’s service for 30 days at the same I will still have Comcast. At the end of 30 days I will decide wether or not to stay with Comcast or jump ship to CCI. First thing first is to test the Upload/Download Speed. 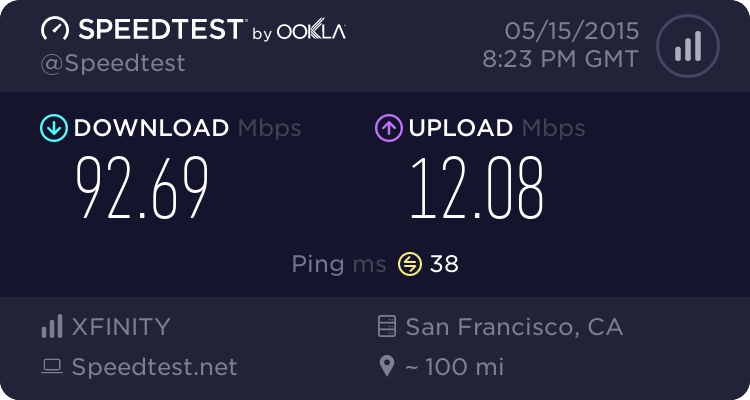 I first ran the test with my current provider Comcast and then immediately after unplugged their line and plugged in the CCI ethernet line into my router and ran the test again. Here are the SpeedTest results taken from CCI and Comcast within 2 minutes of each other. CCI’s download speed came in slightly higher than Comcast, and on the upload side, blew Comcast out of the water. CCI’s ping was much lower than Comcast, which is a good thing. The lower the ping the better. Speed for the price, I would have to say CCI is winning. On the $49.95 deal CCI comes out to $.50 per Mb vs my current rate $78.95 on Comcast is $.79 per Mb. 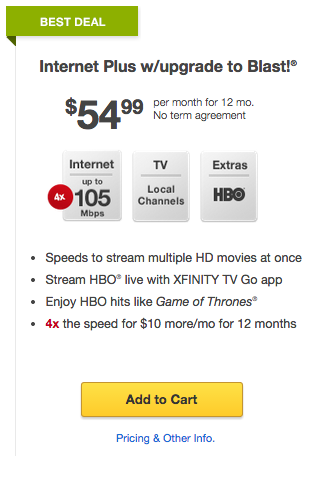 CCI also has no usage cap unlike Comcast, and the price is locked in for 2 years. As internet speeds increase, the rates will mostly likely change again. I’ll probably be revisiting this article in 2 years but as of today CCI is looking like my new ISP. Stay tuned. Very much so. Haven’t had any issues since switching. If you add the charges for no-phone internet only, the total will be another $15~$20 more. My experience living in (Natomas) Sacramento California, I have tried AT&T for 3 years and dissatisfied, I also have tried Comcast for 4 years and dissatisfied on both their internet & TV and worse on their customer service (but not as horrible as Direct TV). On June 2008, Surewest was my service provider until Consolidated Communication took over the deal. CC still maintaining the same customer satisfactory service and providing better connections versus AT&T and Comcast. I use my internet for my security cameras, working and a gamer at home. Even with Smud power outages and sometimes often, but their service remained good. So far so good! CCI is Fantastic! I had them since they were Surewest and they were the best ISP I have ever had. I am bummed that I had to switch when I moved due to availability. Be sure to ask about 1 gig. I now have Wave 1 Gig, no comments yet. 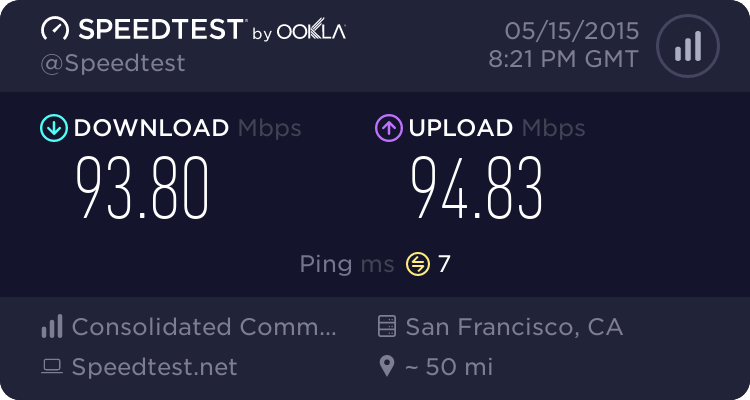 I have CCI with a 100Mb fiber connection, but I am testing Comcast 1Gb service (1Gb down/40Mb up). I am tempted by the fast download speeds I have with the connection so far (avg 800-1.2Gb). The cost is about the same for each service right now. My hold back is that CCI has had pretty solid service, where as Comcast has not had the best reputation for residential reliability of their internet service int he area. I am a bit divided. Keep CCI or switch to Comcast for the 1GB? I have 15 more days to test before my trial of the Comcast circuit is done.